Yesterday was Bookman’s birthday and we have been having a wonderful few days together just relaxing and celebrating. There has been cake of course. Bookman chose a chocolate mud cake but sadly it turned out more mud than cake. But the sins of failed cake can be hidden. Into the collapsed center between the layers went a thick slathering of strawberry jam and all over the top and sides went chocolate ‘buttercream” frosting. It looked a little worse for the wear but it tasted good and that’s what matters most, right? Along with the cake went homemade mint chocolate chip ice cream. Delicious! The day began yesterday by going to our favorite cafe for breakfast. Only we discovered when we got there they are no longer open on Tuesdays. So back home we went, disappointed and hungry. Bookman filled us up pretty darn good though with some fluffy French toast. I am happy to say we went back to the cafe this morning where we got our breakfast this time. The failed attempt at breakfast out yesterday was just the beginning. I had decided to get Bookman some vegan Birkenstock sandals. He had some but they wore out a couple years ago and he never got another pair. It was about time. So we went to the dreaded Mall of America where there is a shoe store that sells Birks. Vegan Birks? No, sorry, you need to go to a place over in Edina where they will be sure to have them. Oh, ok. But while we were at the Mall we went to Sears to get Bookman a new shirt for work and a new tie or two. We’ve had great success with both there before so we were nonplussed to see their men’s department fairly gutted. Bookman has a dress code at work that says he can only wear certain colors. He also prefers Oxford button collar shirts. But there were none. And ties, sure there were some but they were all silk. Where did the big rack of non-silk ties go? To help with once again being disappointed we went to the Barnes and Noble also at the Mall. There we each got a book because we needed something. Bookman got Stephen King’s Joyland and I found a gardening book. Next, to Edina where they were sure to have vegan Birks. The store turned out to be a mostly Birkenstock store. The helpful man in the store showed us some plastic sandals. Um, don’t you have any like these? I asked, waving my be-Birked foot at him. You know, ones that look like suede but aren’t? Sorry, he said. They stopped making those a few years ago, but these plastic ones are great, same arch support and they float in the water. So the only vegan Birks now are those plastic ones? Yeah, sorry. Well, thanks anyway. Home we went, very disappointed. Also, knowing they don’t make vegan Birks anymore, I suddenly don’t want to wear mine anymore because when they wear out, that’s it. At home we looked online hoping to discover a last cache somewhere but no, we even struck out there. Sigh. So all Bookman got for his birthday was a semi-failed cake, a belated breakfast out, and a consolation book. But, being the great guy that he is, he focuses on the fact that we have gotten to spend four whole days together, that we’ve gone for walks and spent time in the garden and had lots of unhurried conversations and just time to be. And so I find myself thanking Bookman for reminding me that birthdays and celebrations aren’t about buying things but about the intangibles that we give to one another and that taking time out to recognize them is the best gift of all. Well, a terrible shopping experience…failed or not the cake looks yummy. Happy belated birthday to the bookman. 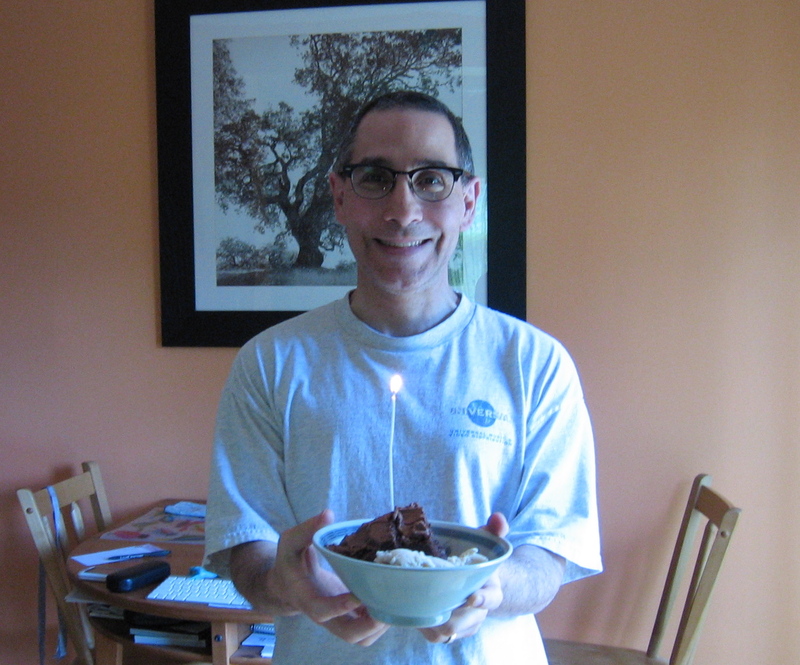 Diane, the cake was yummy and Bookman says thanks for the good wishes! Personally I have always thought that the worse a cake looks, the better it tastes! Happy Birthday to Bookman! rhapsody, heh, I like your cake thinking! It was tasty, that’s for sure. Bookman says thanks for the birthday wishes! Happy birthday to Bookman. I’ve made some great tasting cakes, but never one that looked good. Always thought those were mutually exclusive qualities. :-). Too bad that a trip to the dreaded mall was unsuccessful. But it still sounds like a great day. Anne Camille, in spite of our shopping failure it was a great day and the cake did taste good. Bookman says thanks for the good wishes! Despite the Birks, the closed café, and the sunken cake’s center, it sounded like Bookman had a nice birthday. I’m not seeing much of the Oxford buttoned shirts either. I think you are spot on though with your appreciation of just “being”. Life seems to hurry along and to have days where you can slow down: well they’re pretty doggone special. Enjoy your new B&N’s purchases! Vanessa, in spite of everything it was indeed a nice birthday. The opportunity to slow down doesn’t happen very often so it’s easy to forget just how important and wonderful it is. Bookman already finished Joyland and liked it very much. Happy belated birthday to the bookman! Anyway, a book is always the best present. Not very convenient to wear at work, I agree, but still. Happy Belated Birthday Bookman! It sounds as though you made the best of it, and like you said the together time is the most important (followed closely by yummy cake and ice cream–who cares what it looks like I bet it tasted delicious!–and Books–hmm. maybe not in that order though… 🙂 ). So, shoes floating on water is a selling point? That made me chuckle. I guess in the event of a water landing on board a plane they can be used as a floating device? 🙂 You’ll have to take extra care for yours–I’m very surprised that Birkenstock stopped making them. Maybe the plastic ones will be unpopular and they’ll go back to their former models. Anyway, here’s to another happy and book filled year! Danielle, thanks from Bookman! We did have a nice time and the cake did taste delicious–tastebuds don’t care about appearances thank goodness! Heh, you made me laugh! The guy was trying hard. Now if he had said the shoes would allow you to walk on water, that would be something! Happy birthday to Bookman! I wont’ tell you the several grim things that have happened on or adjacent to my birthday that have made me birthdayphobic. Please, please don’t remember my birthday! I know how you feel about the Birkenstocks. I have a pair of black vegan cowboy boots with white stars on them. They are me, they say exactly who I am, but they finally cracked beyond repair. They no longer make them (just a silly version with a cowgirl on them). I’ve begged the manufacturer to make more, I’ve trolled the Internet, too, hoping someone in Toledo or Back of Beyond has a carton of them in my size. They sit in my closet and I look at them and remember who I once was. Oh, those boots sound fantastic! So sad they don’t make them anymore. You’d think with vegan becoming a more common choice companies would benefit from keeping their vegan products going. I would totally buy those boots. Fingers crossed that someday the boot people and Birkenstock will come to their senses! Happy, happy birthday, dear Bookman. You got the whole thing absolutely and perfectly right and it sounds just the sort of birthday you will both remember as one of the best. It had all the important elements…it had the two of you in it. Grad, Bookman sends his thanks for the good wishes. You know, the older we get the more we appreciate simpler celebrations because the simple turns out to not be so very simple after all. Have no idea how I did that (the picture) I just wanted to let you know Amazon is still selling the vegan ladies sandal…they might have men’s. A very belated happy birthday to Bookman! Wishing him all the very best in life! I think he is one of the best role models ever – I mean had it been my birthday, I would have thrown a fit! When really its about being with the ones you love! I am going to earmark this entry as a reminder of what is truly important!!! cirtnecce, Bookman says thanks for the birthday wishes! He really is a special guy. I am very lucky to have him. Arti, thanks to you from Bookman. And thanks to you from me too 🙂 Heh, nope, Bookman works at LensCrafters and he has to wear black pants, grey or black shirt and allowed accent colors are shades of red and shades of blue in alternating weeks with one week being red week and the next being blue week. It’s kind of crazy but it makes getting dressed in the morning pretty easy. Another belated happy birthday to Bookman – great that you had a fine time! Ian, Thanks from Bookman for the good wishes! Oh I missed this with my two weekends of literary conferences. Happy (belated) birthday to Bookman. As far as I’m concerned Mud Cake is called mud cake for a reason and as such you can get away with pretty much anything – sloppy, slurpy mud or dried mud. Adjust your accompaniments as appropriate! Love your extended birthday celebration. I do think birthdays do deserve such treatment. Whisperinggums, Bookman sends his thanks for the belated wishes. We were just looking in the regular men’s department for shirts but did wader into the Land’s End department which has also become a sad ghost. Lands End does sell button down oxfords online and they actually have an outlet nearby so we will have to try there sometime. The vegan birks he wants are the micro-fibre Arizona ones, which I see from your wonderful link are available in the UK. The online US Birk site didn’t have them anymore. I wonder why that is? Well, it’s nice to know we can get some, just have to figure out the sizing and hope we get it right! Thanks! Oh I’m so glad to be of help re the Birks. I like Arizona as well. Is your sizing different to UK’s? Or, hasn’t he had Birks before? The only Birks I’ve ever bought – in the US (Nordstroms I think for my first pair), Australia, Germany online – the sizing has been the same (ie European sizing.) They are the only shoes I would ever dare buy online. And good luck with the button down Oxfords. Yes, US sizing is very different than European sizing. It’s been so long since his last Birks fell apart he doesn’t remember what size they were. Perhaps with a size conversion chart and my pair of Birks we will be able to figure it out! Yes, so’s our sizing, but the conversion chart should work … I’m 6 1/2 (US/Australia) and 37 (Europe). Size 37 Birks work perfectly for me. Yup, you got it! Briks sold here aren’t in American sizing so it would have been ideal if he could try them on. But looking at size charts, he thinks he’s a 41 and of course that size is currently out of stock!